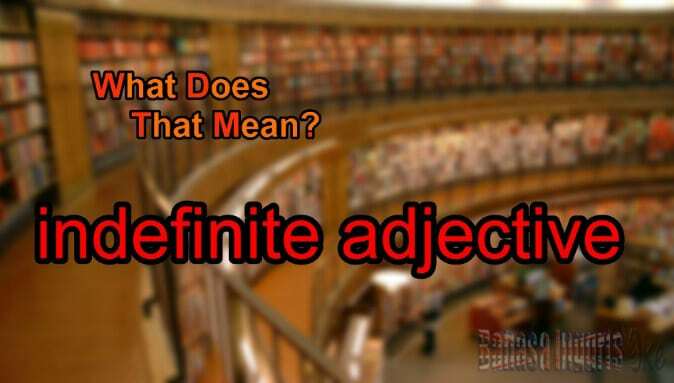 Indefinite adjective adalah adjective yang digunakan untuk menerangkan noun atau pronoun dalam hal number atau quantity. Indefinite diartikan juga dengan Unspesifik, atau unknow, sedangkan jika diartikan dalam bahasa Indonesia memiliki arti tidak jelas bentuk, ukuran dan jumlahnya. Sedangkan Adjective dalam bahasa Inggris merupakan kata sifat yang berfungsi untuk menjelaskan noun atau kata benda. Dalam bahasa inggris Adjective memiliki macam-macam bentuk, salah satunya Indefinite Adjective. Untuk mengetahui lebih lengkap tentang Indefinite Adjective, simak penjelasan dibawah ini tentang cara penggunaan Indefinite Adjective dalam kalimat bahasa inggris dengan benar. Farida lays some flowers in the basket. They didn’t spend much money. The beggar has little food to eat. Doni eats a few cakes. A lot of people come to the hall to see the attraction. Jack become the leader because he has plenty of ideas. My mother doesn’t have any knife in the kitchen. How many chairs in this classroom? There aren’t many teachers in the office. Kata-kata yang tercetak tebal pada kalimat di atas adalah contoh dari penggunaan Indefinite adjective. Kata-kata tersebut di atas digunakan untuk mengindikasikan indefinite number (angka/ jumlah). 1. Menggunakan much and little diikuti dengan benda yang tidak dapat dihitung. 2. Menggunakan many and few diikuti dengan benda yang dapat/bisa dihitung. 3. Menggunakan a lot of, lots of, dan plenty of diikuti dengan benda yang tidak dapat dihitung dan benda yang dapat dihitung. 4. Menggunakan much dan many dalam kalimat negative dan kalimat tanya. Lia didn’t have much time. Do you need many oranges? 5. Pada kalimat positif lebih sesuai menggunakan kata a lot of. I have a lot of foods. Simak contoh di bawah ini! Many visitors don’t come to the new exhibition. There aren’t many friends in the yard. Do you have many toys at home? Gina makes a lot of mistake in his speech contest. I need much salt to cook. Can you help me to buy it? Would you give me much water in my pail? The librarian brings lots of books to the library. We need a few mangos to make the sauce. The man has little energy to fight. The poor woman has little rice to eat. A : What do you see in the classroom? B : I see many tables and many chairs. A : What else do you see in the classroom? B : I see many pupils. A: What do you see in the parking place? B: I see many cars? A: Where can we see many books? B: We can see many books in the library. A: Are there many people in the cinema? A: Does your father have many cars? A : How much sugar do you need everyday? B: At least I need one spoon of sugar everyday. A : Do you drink sweet tea everyday? A : How much sweet tea do you drink everyday ? B : At least I drink a glass of sweet tea everyday. A : Do you drink coffee too? B : Yes, I do. Sometimes I drink a cup of coffee. A : Do you need many pens to work at the office? B : No, 1 don’t I need only few pens. A : Do you need many pencils to draw? B : No, I don’t. I need only few pencils. A : Do many students at your school came late? B : No, they aren’t. Only some students came late at my school. A : Are many teacher at your school very strict? B : No, they aren’t. Only some teachers at my school are very strict. A : Are many students at your school naughty? B : No, they aren’t. Only some students are naughty at my school. A : Why is this land very dry? B : Because there is only little rain here. A : Will you lend me a little money? B : Yes, I will. What will you buy? A : l will buy a little coffee. B : What else will you buy? A : I will a little sugar and a little milk. B : If you don’t mind, please buy me a little hot chocolate. Semoga artikel ini membantu kalian dalam memahami penggunaan Indefinite Adjective yang sesuai dengan fungsinya masing-masing sehingga kalian dapat menerapkannya dalam percakapan kalian sehari-hari.